This past Valentine’s Day, we once again outsourced the kids and made plans to visit our favorite local place for a delicious meal: our house. 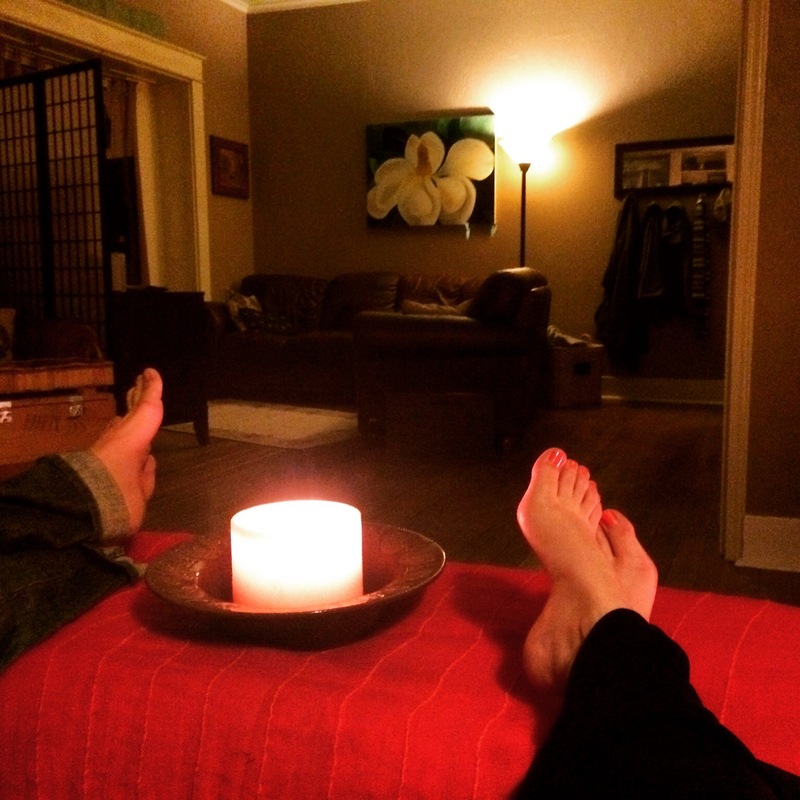 I’ve written before about staying in with your sweetheart, and I can honestly say that it would take a lot of convincing for us to do things differently after so many straight years of truly memorable and enjoyable meals at home together. This year, we kept it incredibly simple. 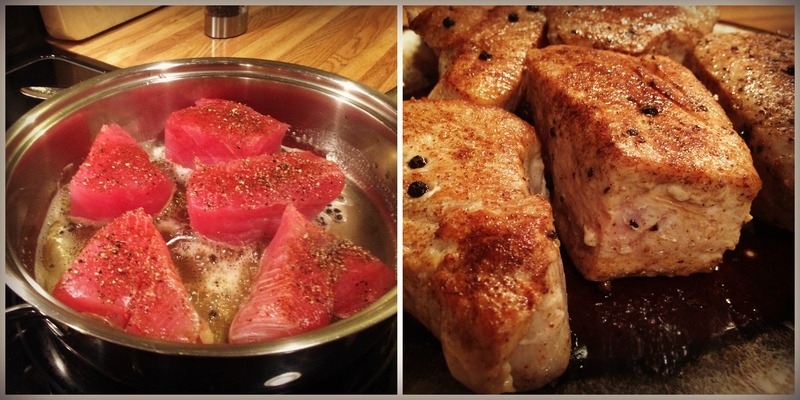 When I first ran across fresh ahi tuna at Sam’s Club, I had a moment’s hesitation. This is one of my single favorite things to eat, and it’s served at some of the best restaurants I’ve encountered. In fact, the first time I had seared ahi tuna was at Pier 66 in Seattle, and it was divine. 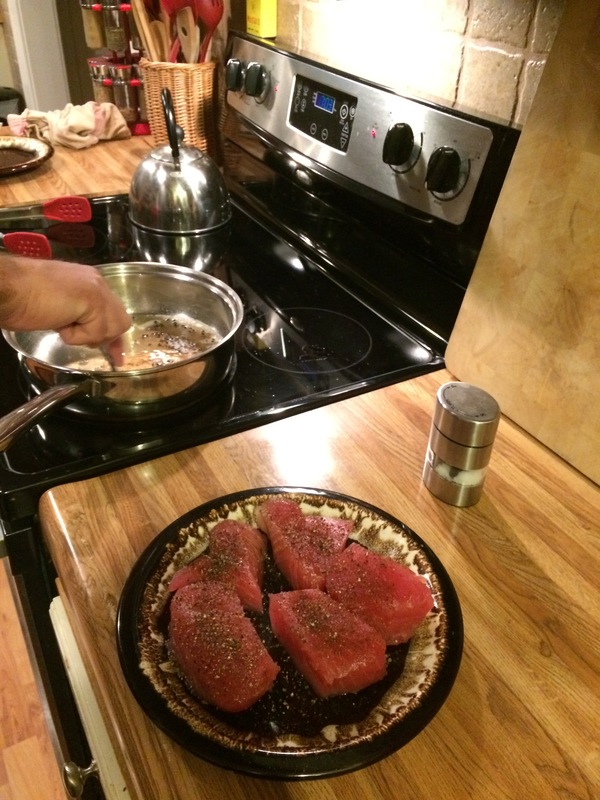 Fred cut the incredibly thick tuna steaks into smaller pieces for searing and seasoned them with some fresh ground salt and peppercorns, which he preheated until they were crispy in olive oil on the stovetop. 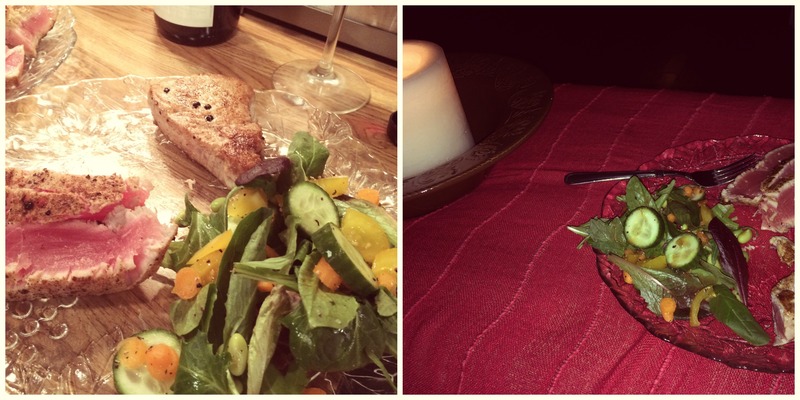 And yes – I completely sat back and let my husband prepare this entire meal! I’d love to say there was more to it, but this was sheer and simple perfection. He seared each piece on all sides and served it up raw in the middle, and I can honestly say it may have been the single best meal we’ve ever had. With a nice little salad on the side and some good wine and conversation (complete sentences included! ), this may have been one of our best foodie celebrations yet. As the new year gets steadily underway, I have the same commitment to food, blogging and life: simple. Relaxed. Approachable. Shared with loved ones. Here’s to many delicious reasons to celebrate. We did the same thing this year! Well, actually we ended up at the house of some friends so that the sitter could put our kids to bed. It was perfection. This meal sounds amazing! I love the simplicity of it.